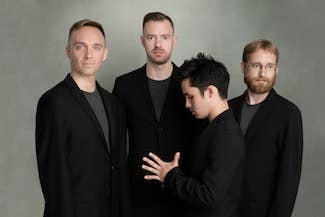 Hailed by The New York Times as the “nation’s most important quartet”, the JACK Quartet is one of the most acclaimed, renowned, and respected groups performing today. JACK has maintained an unwavering commitment to their mission of performing and commissioning new works, giving voice to underheard composers, and cultivating an ever-greater sense of openness toward contemporary classical music. Over the past season, they have been selected as Musical America’s 2018 “Ensemble of the Year”, named to WQXR’s “19 for 19 Artists to Watch”, and awarded an Avery Fisher Career Grant. Through intimate relationships with today’s most creative voices, JACK embraces close collaboration with the composers they perform, leading to a radical embodiment of the technical, musical, and emotional aspects of their work. The quartet has worked with artists such as Julia Wolfe, George Lewis, Chaya Czernowin, Helmut Lachenmann, Caroline Shaw, and Simon Steen-Andersen, with upcoming and recent premieres including works by Tyshawn Sorey, Sabrina Schroeder, John Luther Adams, Clara Iannotta, Philip Glass, Catherine Lamb, Lester St. Louis, and John Zorn. JACK also recently announced their new Fulcrum Project, an all-access initiative to commission six artists each year, who will receive money, workshop time, mentorship, and resources to develop new work to be performed and recorded by the quartet. JACK has performed to critical acclaim at Carnegie Hall (USA), Lincoln Center (USA), Berlin Philharmonie (Germany), Wigmore Hall (United Kingdom), Muziekgebouw aan 't IJ (Netherlands), The Louvre (France), Kölner Philharmonie (Germany), the Lucerne Festival (Switzerland), La Biennale di Venezia (Italy), Suntory Hall (Japan), Bali Arts Festival (Indonesia), Festival Internacional Cervatino (Mexico), and Teatro Colón (Argentina). Additional awards include Lincoln Center's Martin E. Segal Award, New Music USA's Trailblazer Award, and the CMA/ASCAP Award for Adventurous Programming. According to Musical America, “many of their recordings are must-haves, for anyone interested in new music.” Among their dozens of releases, the most recent Cold Blue Music album of John Luther Adams’ Everything That Rises was praised as a “a wise and eloquent performance” by the San Francisco Chronicle, their concept album Imaginist with the Le Boeuf Brothers was nominated for a GRAMMY award in 2018, and their complete Xenakis: String Quartets was named one of TimeOut New York’s “Top Recordings of the Year.” Other albums include music by Helmut Lachenmann, Amy Williams, Elliott Sharp, Hannah Lash, Horatiu Radulescu, and more. Committed to education, JACK is the Quartet in Residence at the Mannes School of Music, who will host JACK’s new Frontiers Festival, a multi-faceted festival of contemporary music for string quartet. They also teach each summer at New Music on the Point, a contemporary chamber music festival in Vermont for young performers and composers, and at the Banff Centre for Arts and Creativity. JACK has long-standing relationships with the University of Iowa String Quartet Residency Program, where they teach and collaborate with students each fall and spring, as well as with the Lucerne Festival Academy, of which the four members are all alumni. Additionally, the quartet makes regular visits to schools, including Columbia University, Harvard University, New York University, Princeton University, and Stanford University. Comprising violinists Christopher Otto and Austin Wulliman, violist John Pickford Richards, and cellist Jay Campbell, JACK operates as a nonprofit organization dedicated to the performance, commissioning, and appreciation of new string quartet music.